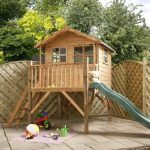 The years of fun, adventures and just generally great times the kids can have with the 7 x 5 Waltons Honeypot Poppy Tower Wooden Playhouse is out of this world. 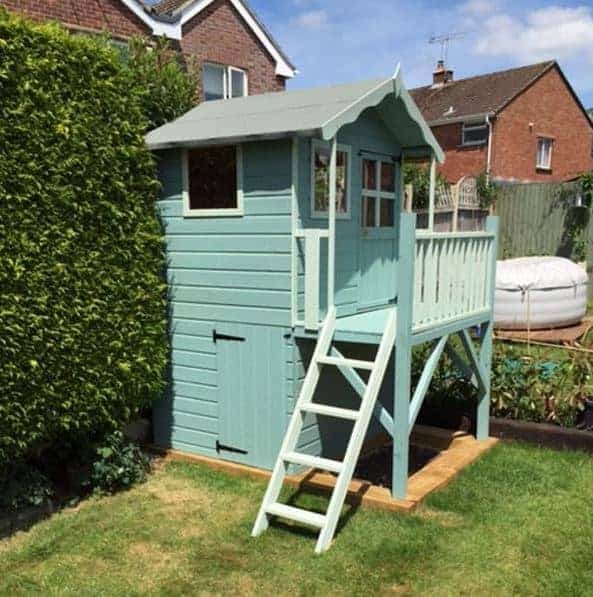 This tower playhouse has a very strong ladder that will take the kids up to a decking area with railing and then into the 7 x 5 playhouse where they can have fun with their friends or even just have epic battles with their favourite action figures. 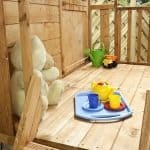 With the decking and the room inside there is just a whole lot of floor space for them to store things and have a lot of fun. Its impressive and elegant design also makes it something that when you look out of your house window, you will be happy to see standing in your garden. 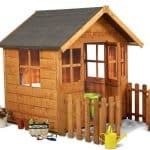 You might also like to see the top 20 Playhouses for Girls currently on sale in the UK by visiting the WhatShed Playhouses for Girls award league table. While this is a playhouse that is made for kids to have fun it has also been made to ensure that your kids will be safe while they do. To start with the walls and frame are very robust and will be able to take years of rough play. All of the windows have been made using styrene that is shatterproof and even the door is child safe thanks to the gap around the edges making sure their little fingers cannot get trapped. In all a wonderful job has been done making sure this is every bit as strong and safe as it is fun. Very few structures can actually make us say wow, where was this when I was a kid, but the 7 x 5 Waltons Honeypot Poppy Tower Wooden Playhouse certainly did that. This playhouse just looks incredible with it being high and it’s just amazing attractive looks. Inside there is more than enough room for the kids to get up to all kinds of fun activities. The depth is 6 feet 8 inches and the width, 4 feet 1 inches so there is more than enough floor room inside here. This is a very tall structure and at the highest point it is actually over 8 feet so inside there is plenty of room for the kids to walk, jump and run, even though you will have told them at least 463 and a half times not to run and jump. This is a tower playhouse so to get up to the actual playhouse we have a child safe ladder that has strong and wide rungs to make getting up and down not only easy, but also something of an adventure as well. Once they get up onto the main level they have a fun balcony that has a safety railing and also there is a splendid veranda that will give them a little protection from the sun and the rain. The actual height of the balcony is 3 feet 2 inches so the kids are going to really love spending time looking out over the garden and of course throwing toys off it. The roof really is quite impressive at the very front there is this attractive wavy wood decoration that just finishes off the whole front of the playhouse very well. Of course as this is over 8 feet high unless you are an NBA basketball player or just came down a beanstalk, chances are you will not be able to see the top of the roof from ground level, but we can tell you it is made with very high quality roofing felt that is over some solid sheet boarding which can take the weight of the neighbour’s cat and all the snow winter can throw at it. The walls have a very smooth and log cabin style of look to them. Walton’s use of 12 mm thick tongue and groove shiplap cladding was very smart as it gives the playhouse a very high quality and strong look, but it is actually some of the best cladding out there when it comes to keeping what you have inside dry. Because of the way it all slots together there is just no way for rain to make its way inside. Waltons love to use a 28 mm x 28 mm frame in their playhouses and it is something we always like. This is a good thickness and as the corners are double framed it really does give the playhouse one very solid set of bones that are going to make sure this can take many years of playtime. Inside the actual playhouse from the pictures you can see that they have used the same kind of solid sheet boarding for the floor. 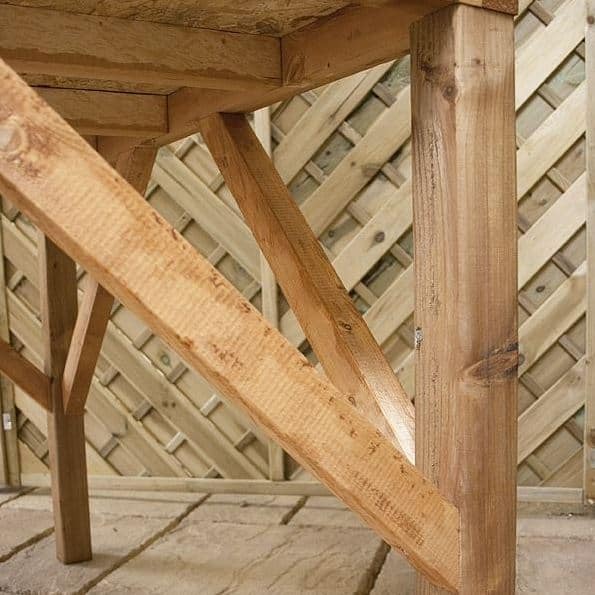 Waltons always make sure that the floor is just a little bit thicker than the roof so it can take lots of weight. Outside on the decking area the flooring is made with thick and high quality tongue and groove boarding as it will be exposed to the elements and of course have the kids jumping up and down on it like crazy people. This will need a little looking after to stay rot free. The whole playhouse should be treated with wood treatment after construction and then have a nice, fresh coat a year down the road. 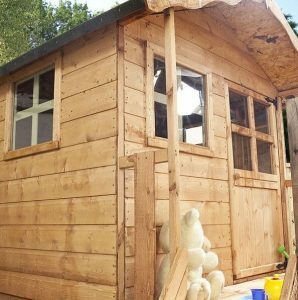 Treating the playhouse is really not a big deal, especially considering you will be given a free 5 litre tub of wood treatment that is a lovely golden brown colour. 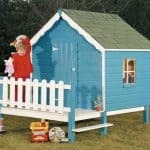 The ten year anti rot guarantee that comes with the 7 x 5 Waltons Honeypot Poppy Tower Wooden Playhouse is one of the more generous guarantees we have seen, but you must make sure you treat the shed as that is required for this guarantee to be valid. We were very impressed with the size of the door on this playhouse. It is 2 feet wide and 3 feet 6 inches high. The door has a large Georgian style window and it even has a little gap around the edges so that there is no chance of trapped fingers when they are slamming the door. Speaking of slamming the door, Waltons have made sure to use some very strong door hinges to prevent the door from sagging over time. As well as the window on the door, three other windows are included with this playhouse. On the front of the playhouse we have another good sized window to go with the one on the door. Then there is one on each side, this will make sure plenty of light can enter the structure. These windows have been made with kids in mind so rather than use glass which can easily smash, Waltons have used 2 mm thick shatterproof styrene. Like their other playhouses, Waltons have not put a lock on the door. The idea of this is that the kids can come and go as they please and not require mum and dad to unlock it all the time for them. 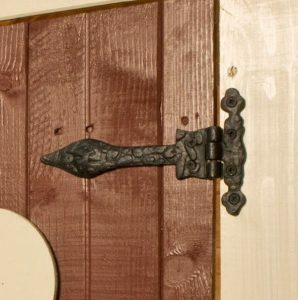 During the winter months when it is really cold and miserable outside, you may want to add a pad bolt to keep it securely locked up when the kids are not using it. 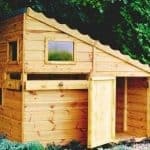 This is just such a great looking playhouse that people are always going to want to look at it and with those four windows it is very easy to look inside. This is great for the parents as it lets them keep an eye on what the kids are doing, but for the kids having mum and dad watching them all the time may get a little old. A little fabric over the windows is a low cost way to give them a little bit of privacy. 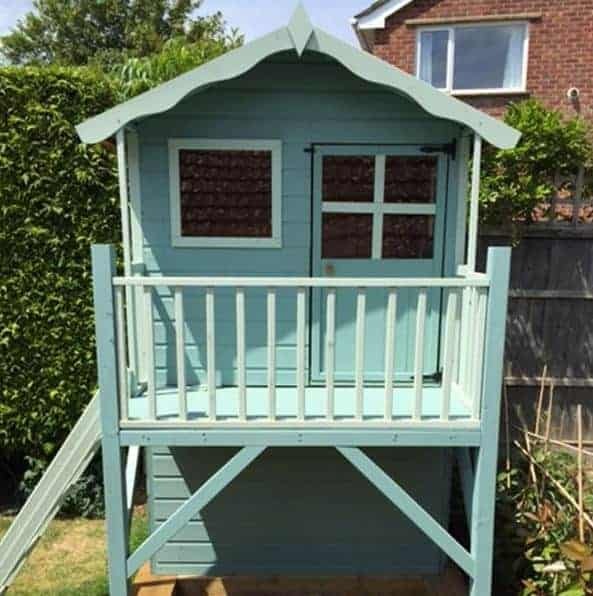 There is not any customisation options available with this playhouse but if you wanted to spice things up a little then rather than using the free tub of wood treatment you get with it., you could purchase a more colourful type of wood treatment. Waltons do have a few extras for you to have a little think about. First of all is their installation service which at a cost of, £199.99 is a little high for us, but if DIY is not your thing then it may be something to consider. While we like the roofing felt that comes with this as standard, they do have a superior 10 mm olive green coloured roofing felt for, £34.99. Also if you are looking for a playset to go with this then Waltons do have a fun, kitchen playset you can add at a cost of, £49.99. 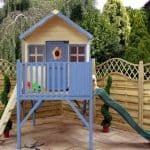 This is a playhouse that is well made and clearly Waltons have chosen the materials very cleverly. The quality of the materials is very impressive as is the fact that with just a little care they will last many, many years. 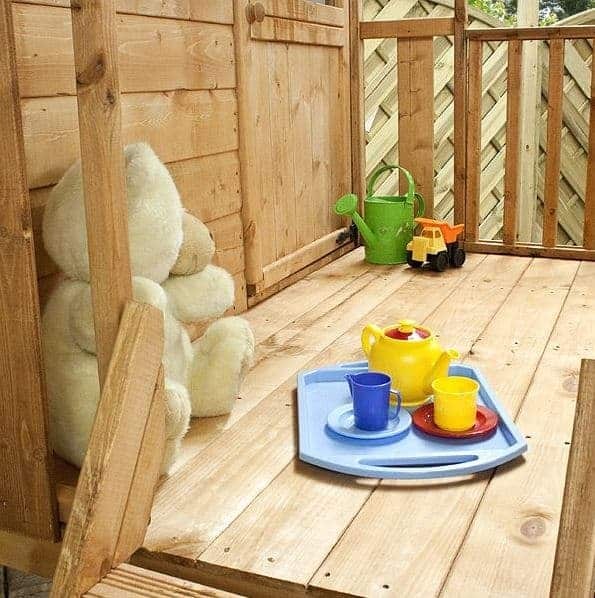 We love just how much room there is to play inside the actual playhouse, but as well as this they have the decking area and if they want they can even play underneath. We won’t lie, this can be a tricky build and is at the minimum a 5 hour job, but with a good look at the instructions, a friend, a toolbox, and some snacks this can be quite the fun experience. We feel that due to the elegant look, size and quality of materials used that this is a playhouse that really is great value for money. 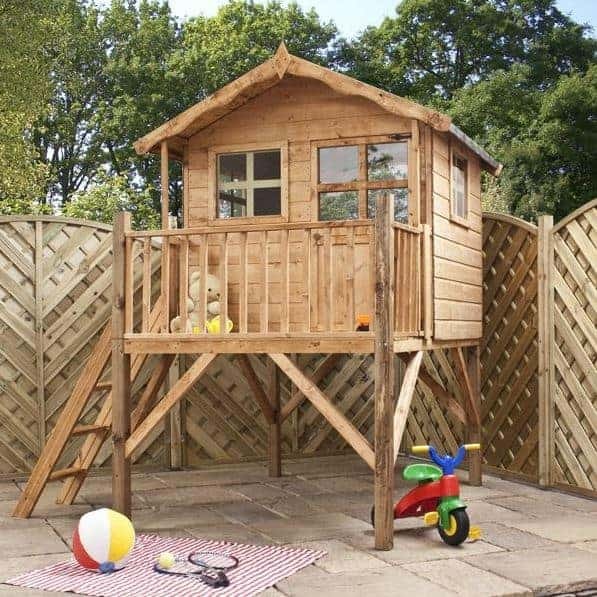 Final Thoughts: We do know that Waltons have many other high quality playhouses that are cheaper than this one, but there is no denying the fact that the 7 x 5 Waltons Honeypot Poppy Tower Wooden Playhouse is one of their most incredible and impressive looking playhouses. It has a look that just screams high quality and we are sure the kids will fall in love with it the moment they see it. 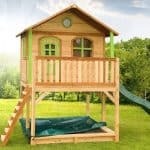 While the price may seem a little high, we must tell you that you really are getting a high quality playhouse and that this would be worth considering saving up for an extra month or two to buy before you pull the trigger on a cheaper playhouse.